This is the "Real" and "Correct" Manual and it is "FREE"
I've never understood why anyone would write and sell their own EFT manuals when Gary has always given the "real" EFT Manual away for free. It seems completely unethical to not tell newcomers about the Free Manual just so they can sell theirs and make money. And to add insult to injury, they are not even correct. They are selling watered-down and distorted versions of their own creation. 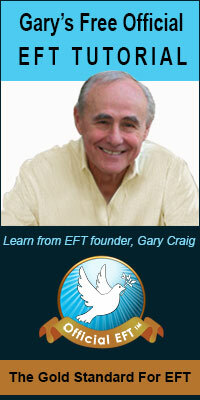 Please do not waste your money and time on any EFT products that were not created by Gary Craig, the founder of EFT. The only way to guarantee that you are actually learning the "Real / Authentic" EFT, is to make sure that your books or videos are all by Gary Craig, the founder of EFT. There are many people teaching and writing EFT manuals, books and videos, however most (if not all) of these are Not correct. Many have distorted the techniques and other powerful components of EFT. Many have also added on all sorts of techniques and concepts of their own. This would be fine if only they were honest and explained that this is their version and this is not the "real EFT"
The only way to guarantee that you are actually learning "EFT", is to make sure that your books or videos are by Gary Craig. Gary wanted to make EFT known to everyone and gave everyone the freedom to use the name EFT - Emotional Freedom Techniques. Unfortunately, many people misused this gift and turned it into a big money making business at the expense of EFT and all newcomers to EFT. You can find many books and videos for sale on the internet. They are marketed with great "Hype" but little substance or accuracy. In fact, some have distorted it or simplified it to the point that they have not even included the most powerful techniques and components of the "Real EFT". You can go on youtube and find many videos on EFT, but unless you have studied the real EFT by Gary Craig, you won't be able to tell which ones are demonstrating EFT correctly and which are not.